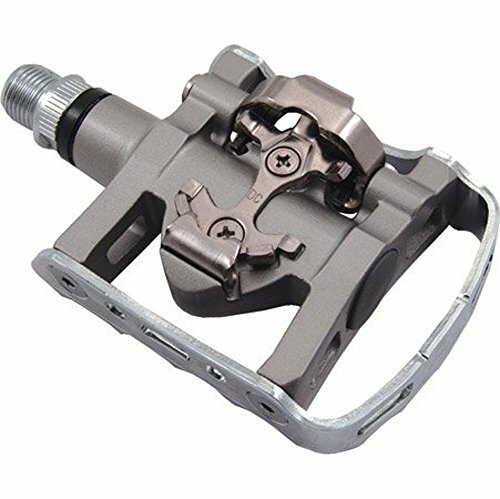 What are some good, clipless bicycle pedals for newbies? Getting the right clipless pedal is crucial for beginners. Your pedals are an important interface between rider and bike, a crucial contact point for delivering power to the cranks. Finding the right pair should be a top priority for any road cyclist, regardless of experience or riding ability. Also called ‘clip-in’ or ‘step-in’ cycling pedals, they affix your shoes firmly to the pedals, letting you focus on your speed, cadence and terrain rather than your grip on the cranks. They’re intimidating to try out, but with the right set you’ll be hooked. A good set of beginner clipless cycling pedals should be easy to clip in and out of, yet capable enough to provide an enjoyable ride and last a long time. This article will do two things: first, it will suggest some great clip-in cycling shoes with easy features and good durability. Secondly, I’ll make a shoe suggestion to match with the pedal. We’ll focus on inexpensive, affordable components only. Ready to check out a few of the best and easiest clipless pedals for beginners? Keep on scrolling down. If you’re extremely worried about your ability to clip in and out of your pedals, and your commute to work means a large amount of stop-start cycling in traffic, you might want to consider Shimano’s very versatile M324 pedals. They have a unique double benefit. The M324 features both a flat side for when you feel uncomfortable riding whilst clipped in, and on the reverse a Shimano SPD cleat mechanism to use when you feel comfortable with it. This dual option gives a rider the best of both worlds. The Shimano M324 is a great clipless pedal system for beginners, and will allow the rider to upgrade to a double sided SPD pedal in future without the need to change shoes or pedal cleats. The M324’s SPD cleats use Shimano’s 2-bolt mounting system; it’s always good to check for compatibility before purchasing a pair of cycling specific shoes. The M324 makes a great team with Shimano’s mountain cycling shoe. The shoe looks like a sturdy hiking or sports shoe and blends in with a recreational cyclist’s everyday wardrobe. Not only does it look great, but it performs well too, and the recessed clips allow you to walk around when not on the bike. It’s one of my favourites. Recap: Usable with or without clipless shoes, simple and affordable, wide platform, very popular. 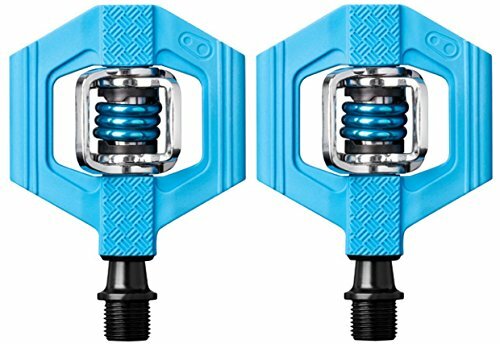 Those anxieties over whether you’ll be able to get your foot clipped into the pedals whilst mountain biking can be alleviated by picking up a pair of Crank Brothers’ impressive Candy 1 pedals. Crank Brothers Candy pedals are pretty unique in that they offer 4-sided access so you should have no need to worry over whether your traditional double sided pedal is positioned to allow you to clip in. By offering four-sided entry to engage with the pedals it should make clipping in a whole lot easier. The Candy series of pedals also feature a composite protective outer casing to help protect the mechanism against damage. The Candy 1 is also available in a selection of colours to easily match with your bike. Furthermore, its cleats are compatible with 2-bolt mountain bike shoes such as Mavic’s Pulse. The Pulse makes an excellent mountain biking shoe for beginners and intermediate riders. It offers comfort and performance on a relative tight budget. The Mavic Pulse features a grippy, aggressive sole for those tricky sections where you have to swallow your pride, get off and push. It sports highly breathable synthetic and mesh uppers and three Velcro closure straps to allow adjustment on the go. The Pulse is a great beginner mountain cycling shoe and its primarily black colour scheme will still look new even after all the muddy abuse you inflict on them. For beginners looking for a reliable and relatively inexpensive clip-in road bike pedal, the Shimano R540 pedal could be the right choice. Its adjustable tension makes for an easy-to-use, novice-friendly road cycling pedal. And fortunately, this pedal can just as easily be used by a far more experienced rider without deterioration in performance. The R540 offers a large, reassuring platform for a rider to engage with and includes a reliable pedal with high quality bearings that will offer the user long term performance. This product has the performance of a high-end pedal with the only trade off being slightly more weight in comparison. It’s also a widely-used and very popular pedal, meaning that it won’t likely go obsolete on you. The R540 pedal will work fantastically when teamed with Pearl Izumi’s feature packed Select RD III road shoes, which offer exceptional performance thanks to a stiff, efficient sole designed to transfer as much energy as possible into forward motion for the rider. The shoe is designed with comfort in mind with an anatomical closure system that reduces pressure and heat spots. 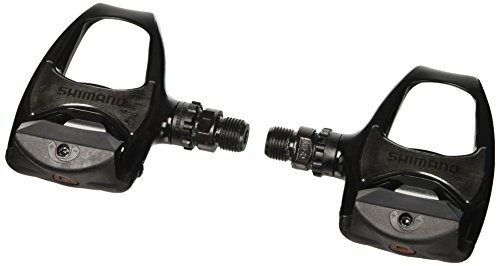 It’s a nice, inexpensive choice, and combined these two items are a good clipless pedal system for newbies and entry-level riders. Have any suggestions that I missed? What do you ride on? What did you learn on? Feel free to leave a comment in the section below. Wow, no love for Speedplay? !